True inner transformation and increased happiness will come to you when you use these specific exercises to practice gratitude. I can't emphasize enough how important it is to practice gratitude when you are following your path to personal development growth. And interestingly, expressing gratitude has recently been scientifically proven to improve your brain and your life. You can train yourself to constantly be thankful for the little things, it's important to think of it not only as a tool for transformation, but as a way of life. Now, if you have wrapped your mind around the fact that everything is energy then you realize there is no separation and we are all connected. Everything is energy with it's own rate of vibration that attracts things of like vibrations to it. That of course includes our thoughts. And thoughts and feelings of gratitude are some of the most powerful and healthiest emotions which can be a gift of healing for yourself and others. BE THANKFUL IN ADVANCE: It has been said that the most powerful form of gratitude is the kind which you express in advance of your actual experience. The expression of faith and trust in the universe that this requires allows for the most effective type of vibrational shift. FIND THINGS TO BE GRATEFUL FOR IN BAD SITUATIONS: Focus on someone you have a conflict with or on a negative emotional situation in your life. You then look for things to be grateful for in those situations. They may not be obvious, but they are ALWAYS there. A more expanded, higher energy will come from this and that has been physically measured on the vibrational scale. Learn more about vibrating at Love or Above here . KEEP A GRATITUDE JOURNAL: It's a good practice to take 10 minutes a day to write down things/people/behaviors/situations that you are grateful for and that bring you joy. They can be big or small as long as you tune into the feelings of gratitude for having them in your life right now. But if you want to get the most benefit from gratitude... then be specific - try counting all the things you have in your life that money cannot buy. Watch the video above to see why research shows that if you write down 5 detailed sentences about that thing you're grateful for, you'll be more elated, excited, and alert and less tired, sad, and lethargic. General gratitude examples: a stress-free commute to work, a call you got from an old friend, a delicious meal, a hug from your child, a compliment you received from your boss, a great night's sleep, an invigorating workout, a smile from a stranger, a short line at the grocery store. 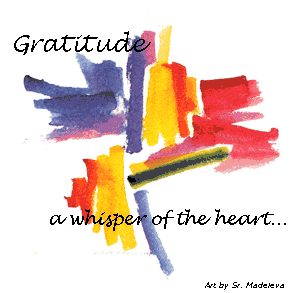 Detailed gratitude examples: I'm grateful for a great night's sleep. I'm grateful that I can afford a luxuriously comfortable bed. I'm grateful that I can wake up refreshed and get an early start to a productive day. I'm grateful that my kids slept peacefully & happily through the night. I'm grateful to get a warm hug from my spouse each morning. I'm grateful that the morning sunshine streaming in my window makes me smile. DO A GRATITUDE WALK: As you're strolling with the kids, walking the dog, or doing your chores, look around and rattle off as many things as you can think of to be grateful for. Tell the universe out loud what you love about your life. KEEP A GRATITUDE JAR: For a physical representation of all your blessings, create a gratitude jar. When you write down your gratitude for the day, put it in the jar – and read what you’ve written on days you’re feeling sad. It's great for your kids to join you and you can read them out loud at the end of the week to reflect and acknowledge the good things. WRITE A GRATITUDE LETTER: Write a mock letter to someone very important in your life who would be excited for your news. Tell them how grateful you are about this wonderful thing that's happened in your life. Doing this exercise will bring about intense emotions and will put you in a joyful, grateful vibration. TIP: You can even write this "as if" that something happened to try and attract it into your life. PRACTICE SELF-GRATITUDE: Look in the mirror. Have a trigger behavior, like brushing your teeth, that reminds you to think of something you like about yourself. Be grateful for something you accomplished or something about your character. Just make sure you practice gratitude every day. Create a routine that's easy and sustainable. When it comes to creating and experiencing more peace in your life, it's a law of the universe that it will always deliver in the right time for the right vibration of your body. So if you practice gratitude, you will energetically raise your vibration and speed up the process of attracting more of what you desire. There is truly NO BETTER WAY to do that than when you are in a state of gratitude.